As you may know (since the 11 people who read this blog are my friends and family), I recently started a new job at Durham University after seven happy years of life, study, and work in Edinburgh. And what, you may ask, is my new job? 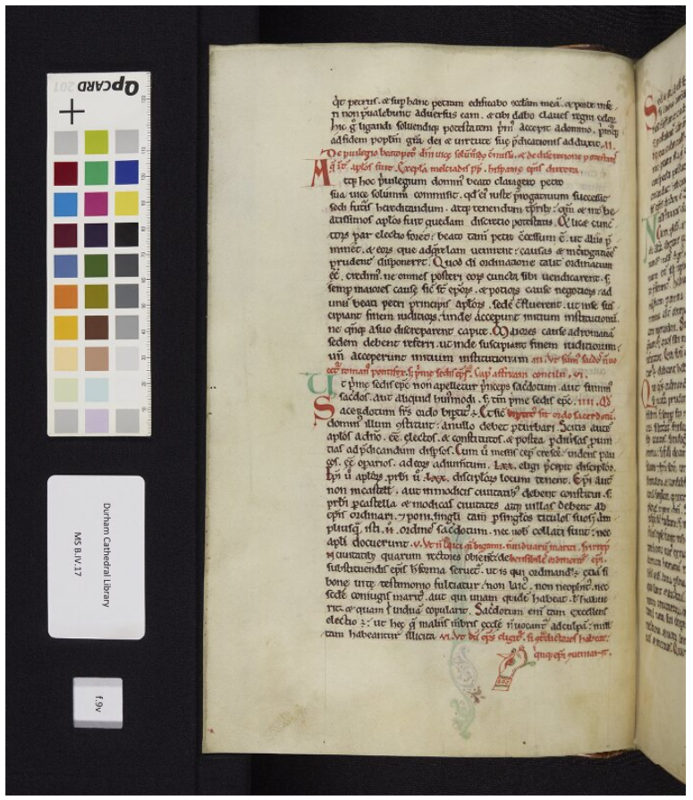 I have a one-year post-doctoral research post associated with the project ‘Durham Priory Library Recreated‘, focussing my research on Durham Priory’s collection of canon law manuscripts. I am starting my research with a canon law manuscript that William of St-Calais (Bishop of Durham, 1080-93) brought to Durham when he became bishop and refounded the religious house associated with the cathedral as a Benedictine Priory. He also started the rebuilding of the cathedral into its Norman/Romanesque magnificence in 1093. Bishop William brought 50 manuscripts with him, including the manuscript I’m initially looking at, a copy of Collectio Lanfranci, a canon law collection brought to England from Normandy by Lanfranc of Bec, Archbishop of Canterbury 1070-89; this collection is a trimmed version of the collection associated with the name Pseudo-Isidore (on whom/which I turn your attention to the work of Eric Knibbs). After, or alongside, William of St-Calais’ Collectio Lanfranci, I’ll be studying the cathedral priory’s other, later, canon law manuscripts. If canon law doesn’t float your boat, perhaps William’s Bible will. 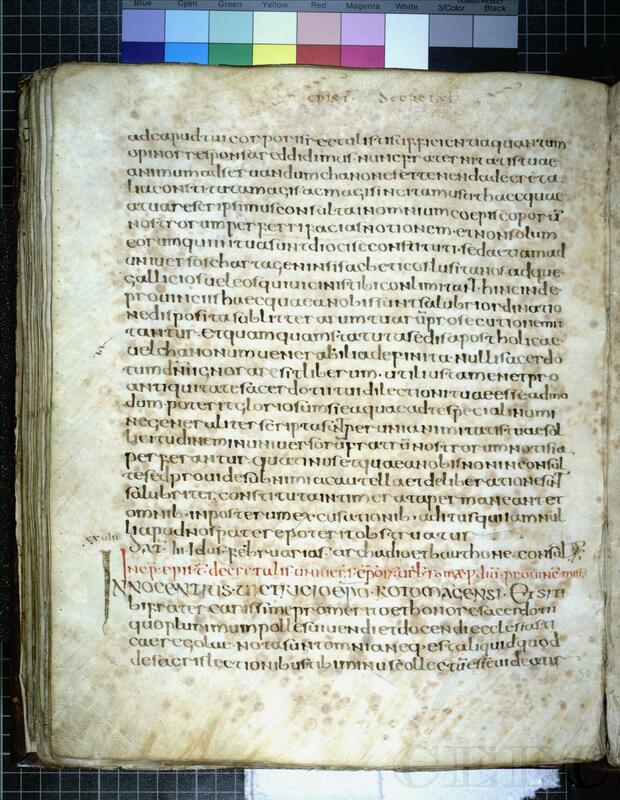 The research project is a digitisation project bringing together in one digital place all of the manuscripts and early printed books that belonged to the pre-Reformation priory. This means not only the ones at Durham Cathedral and Durham University but also manuscripts that have gone off wandering to London, Cambridge, Oxford, etc. Besides studying the priory’s manuscripts for the creation of new scholarship, I will also contribute to the project blog and engage in public outreach — public lectures, seminars, that sort of thing — besides organising a scholarly workshop in 2018 about Canon Law in Medieval Durham. I have already settled into my new desk and started ploughing through the material about Durham and William of St-Calais, much of which was written by Symeon of Durham (d. 1129ish). Perhaps I’ll write about him soon! I’ve also visited the cathedral a couple of times and walked down by the river and generally enjoyed living in a city with a big, famous cathedral and a castle. This entry was posted in Books, Christianity, History, Mediaeval, Monks and Monasticism and tagged canon law, collectio lanfranci, durham, durham cathedral, durham priory library recreated, durham university, lanfranc of bec, manuscripts, symeon of durham, william of st calais on September 27, 2017 by MJH.